The La Quinta Resort Dunes Course has been ranked as one of the Top 100 courses that you can play, and this well-known course was designed by the legendary Pete Dye. 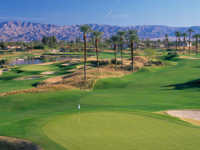 The course has amazing views on every hole, and the course offers a challenge for ever golfer. The course has multiple tees, and playing from the 6,712 yard back tees offers a course rating of 72.4 and a slope of 134. The 17th hole at this course is the signature hole that will tempt the long hitters. You need to play smart golf to score on this course. There is so much to do here besides just playing the courses. All of the practice areas you need are available, and you can have clubs custom fit for you. Professional instruction is available, and you will see why the pros play at La Quinta as soon as you arrive. La Quinta Resort Dunes Course tee times go quickly. You need to make the times far in advance if you want to play this course. La Quinta tee times can be made by calling the pro shop or online. La Quinta golf deals are available, and you can get even better deals with some of the packages that include restaurants, spa treatments, tennis courts and many of the other amenities that La Quinta Resort offers.